Renowned Odia sand artist Sudarsan Pattnaik has won the gold medal at Russia’s 9th Moscow Sand Sculpture Championship “The magical world of sand” 2016. 20 top sculptors from different countries competed at the championship, which was held from April 21 to 27 at Kolomenskoye in Moscow. Sudarsan Pattnaik won the competition for his 15 feet high art work “Mahatma Gandhi’s sculpture for non-violence and peace”. “I am very happy to have won the title for my country. The director of sand art festival PaveI Minilkov presented the gold medal and the trophy at the ceremony today. 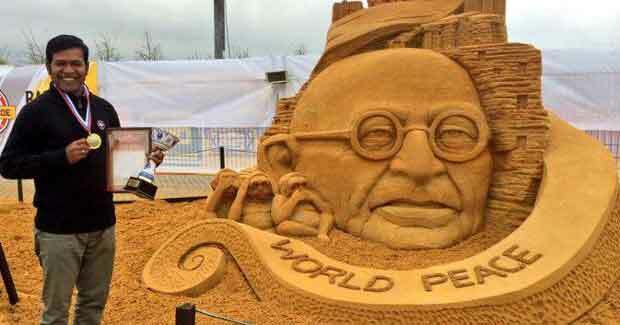 I have tried to show through my sculpture how Gandhiji’s non-violence concept will bring global peace around the world,” Sudarsan Pattnaik said on winning the Gold medal.